Here are 3 warehouse resume formats used the most when creating your resume. Go ahead and edit all of our resumes in word. While you are at it play around with some different styles that word has built in, try using bullets. They are great for making things stand out to the reader as they draw the readers attention to the bullets. To the reader, the bullets hold important information. 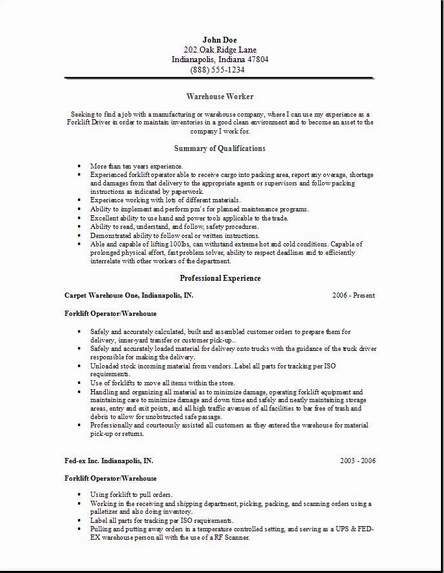 After you experiment a little editing, you will see how easy it is to use our warehouse worker resume, you will also like the look of it better after adding your own touch. I hope you find these free warehouse resume useful. Visit some of our other pages looking for other examples that you might like. They might help give you some suggestions on what to add or change on this resume. 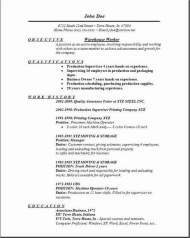 Here is how to get the interview with this warehouse worker resume. Follow my 4 tips that will make a huge difference in your success of getting chosen for an interview. 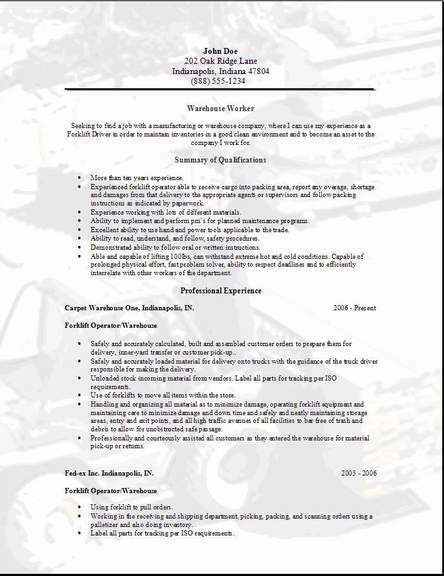 Yes, you can do this yourself, just like a professional, using one of our warehouse worker resume templates. State up front the position you are applying for. Create a professional summary or objective, that starts with your title first. You want a position as a warehouse worker so write, "Warehouse Worker" right at the very top of the warehouse worker resume objective or summary. Then finish the rest of your objective statement on what you have to offer the employer. I am an extremely efficient, productive team player, well liked among my co-workers and supervisors. With 5 years experience, I will quickly learn your procedures in the warehouse. Do Your Research First—Then list your Skills. First you have to understand the employer. Know the requirements for the position you want. Understand what the employer is looking for. Most important, know the words and phrases they use to describe it! To do this go to Indeed Job Search on this website and enter your job title that sounds like the one you want to target. Make a short list of the skills they have listed in the job description. Use these same skills on your resume. Showing this employer that you have the same skills they are looking for. Great job so far, keep thinking, I want this interview. You will only have about 10 seconds to make an impression on whoever is looking at your warehouse worker resume. The top portion of your resume is where they will look 1st. So place your most recent warehouse experience first. Yes, they are looking for the most experienced, so do your homework when you review their job description at Indeed Job Search. Focus your Warehouse Worker Resume on Results. The employer wants to know that you can solve their problems, and you can step in quickly, performing the job they need you to do. Any time you can point out how you saved cost, increased warehouse efficiency, or you helped at solving a problem, your employer will see you as a valuable addition to the team. List any of these achievements under your past employer experience. You can accomplish this challenge with our warehouse worker resume template, so get out that old resume that you've been thinking about sending out, review these 4 tips and get editing! Most importantly is to lookup each job description for each company you are applying for and list the skills they have listed. This is what they are looking for, and nothing else will do. You will get an interview if you follow these 4 tips! I hope you like the choice of downloading 3 of the most useful resume formats. Some people like Chronological, I am one of those people myself. The picture background was added to give you the option of standing out from the crowd. You know the pile of resumes that are stacked on someone's desk, and with the picture, they just might add you to the call in list. You never know until you try something different. Drop me a comment back on the contact us page with suggestions, I would like to hear good or bad. Just trying everything I can to give you more options. Look through the information till you find something. Put it together by adding a little from this example or some from that example till you get it accomplished. I hope you have great success. Your Cover letter is at the top.